In a 7 or 8 inch skillet, heat olive oil over medium heat. Dice onion and add to skillet, cooking until onion is translucent, 4-5 minutes. Stir in paprika and turmeric, cook for 30 seconds. Add water and stir until everything is well combined. Carefully stir in cubed sweet potatoes, enough to fill the skillet. 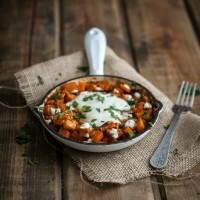 Cover with lid and let sweet potatoes cook until almost tender, 6-8 minutes. Create a small well in the center and crack eggs. Sprinkle Goat cheese on top. Reduce heat to medium-low, cover, and cook until egg whites are set.